Obvious. I don't have to figure it out again if I haven't used it in a long time. It turns your phone's ringer off for a specific period of time, after which it is restored. You no longer need to remember to turn the ringer back on. 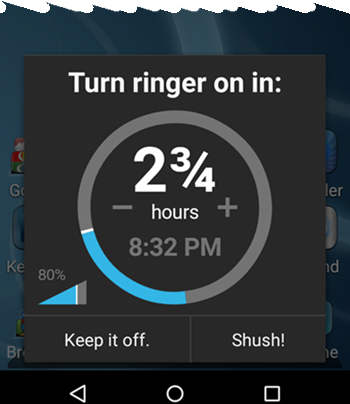 You turn your ringer volume down, and instead of simply shutting off the ringer, shush pops up with however long you had it off before. It then lets you set how long before it turns back on and what volume to return it to. It has a simple dial to add or remove time. Press Shush!, and it'll come back on after the allotted time. It even shows you when it will come back on and at what volume. A really useful free program. There are lots of ringer controls, the one I use is from Public Object.